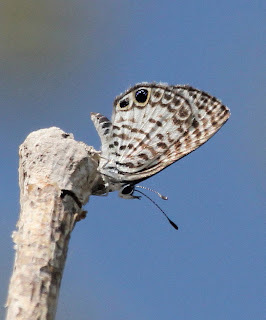 I certainly did not intend to take so long to post this final entry about my late-April “birding and nature” trip to Florida. I must apologize, but I was called away on a death in the family and am trying now to get back into the normal rhythm of things. So, now let’s conclude the Florida trip! When I last wrote, my mother and brother and I had visited the Everglades in extreme southern Florida. The only place left to go from there was the Florida Keys and the Dry Tortugas. Unfortunately this was a short vacation and we could not spend nearly as much time as we would have liked exploring these areas, but we certainly enjoyed the time we had there. The Florida Keys span some 100 miles between Key Largo and Key West; they are connected by causeways and 42 bridges, including one bridge that is seven miles long. I would have loved to spend some time exploring as we drove to Key West but the day we travelled it was far too windy to see any wildlife. But the drive was just beautiful, turquoise waters and various kinds of seabirds soaring over the highway as we drove along. That evening we went to Fort Zachary Taylor at the extreme southwest tip of Key West. 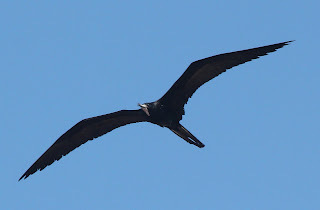 We walked through the picnic areas and along a small beach as evening turned to twilight, and I took a few pictures (below), including the one of a Magnificent Frigatebird at the top of this entry. 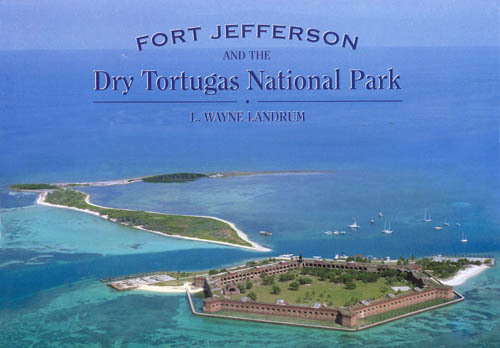 Years ago I went to the Dry Tortugas by seaplane; this time I thought the ferry would be the best way to travel, gliding along the glassy Gulf waters and seeing sea turtles and birds along the way. Nice idea, but on this particular day the Gulf waters were angry and very choppy as the wind continued to blow. Most of us got seasick to some extent, and my poor brother in particular got violently ill; not the peaceful and beautiful ride I had envisioned at all. 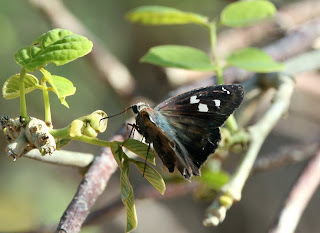 Once we got to our destination and got off the boat, we all recovered and enjoyed some wonderful birding. The Dry Tortugas are well known as a birding “hotspot,” especially during spring migration. 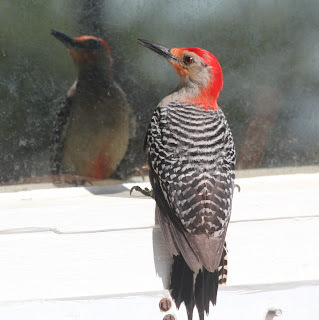 Songbirds that migrate from Mexico and fly over the Gulf waters are often exhausted by the time they reach North America and will drop onto the first piece of land they see to eat and to rest. 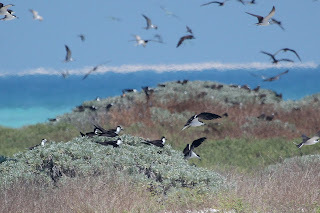 The Dry Tortugas are a magnet for these birds, especially following turbulent weather, and birders who go there hope they have chosen a day with a large “fallout” of these migrants. 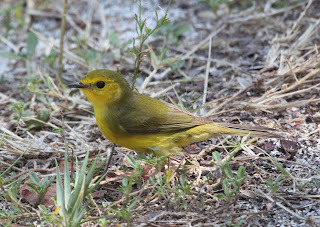 This female Hooded Warbler was easy to approach, probably because she was so exhausted. Don’t worry about her, though; she ate a few meals and perked up nicely. This Yellow-billed Cuckoo stopped at Fort Jefferson on its migration to more northern areas; it could very possibly be breeding in Virginia this summer). 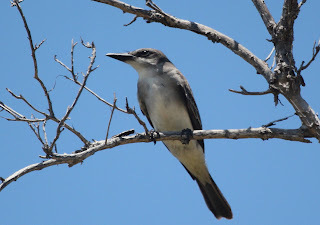 (In North America, the Gray Kingbird occurs only in the far southeastern states, mostly in Florida. 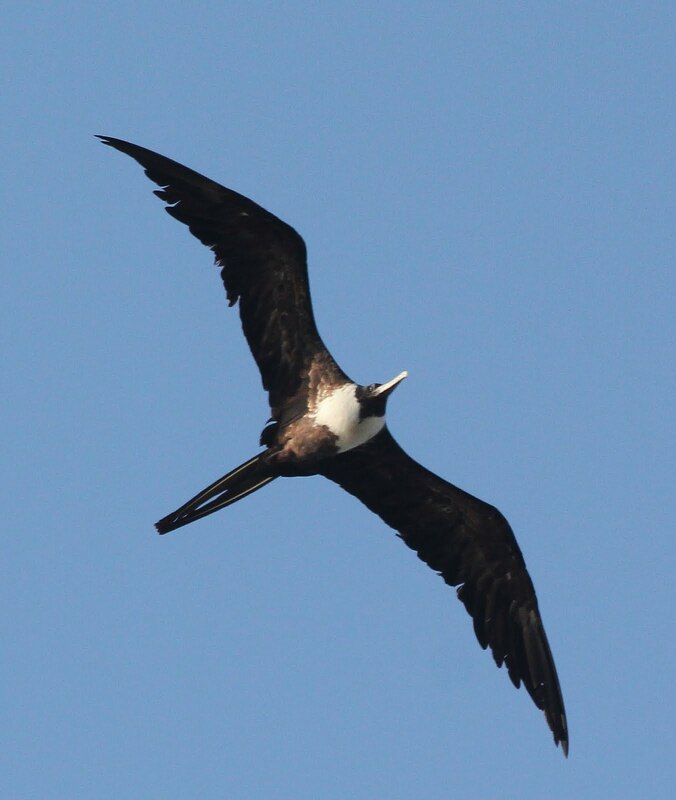 In addition to the hoped-for songbird fallouts, birders who visit the Dry Tortugas are also treated to spectacular views of some seabird species that are very rarely seen anywhere else in North America. 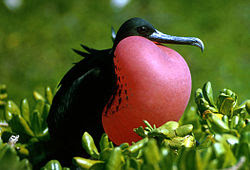 Bush Key is the site of a large nesting colony of Sooty Terns every year; Hospital Key hosts a few Masked Boobies; Magnificent Frigatebirds soar overhead, and Brown Noddies are numerous. 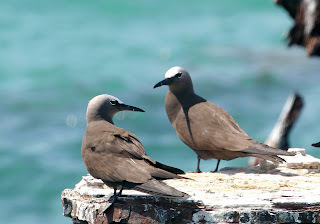 (Sooty Tern colony, above, on Bush Key, viewed from Fort Jefferson). 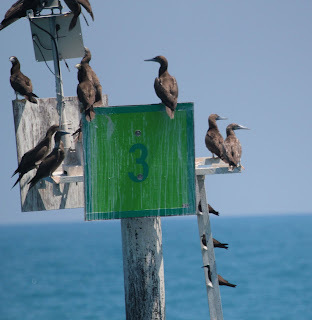 On the buoys near Fort Jefferson one often finds Brown Boobies (below), and we hit the jackpot that day as we headed back to Key West, finding at least a dozen on this one buoy alone. And on that note, we’ll say good-bye to Florida, for the time being. It was wonderful to share the experience with my mom and my brother and I hope we can do it again very soon.